The G.G. record label out of Birmingham is an obscure one that recorded R&B, country and rock & roll songs by local artists. Several G.G.s have turned up in on-line auctions fetching decent prices that are undoubtedly due, at least in part, to their rarity. Definitely because G.G. recorded some good music that has endured long past the lifespan of the label. Of the four G.G. groups I've been able to locate, all have made it onto collector-type compilations. Bill Lancaster's "Too Young To Get Married" is on Boppin Hillbilly Volume 20; Bill Perry and Harold Price Orchestra With The Bel-Aires "Hoppin Boppin & Rockin" on Black Which-A-Way Rhythm; Thunderbirds with Art Harris "Love is a Problem" on Dazzling Group Sounds Vol. 7 and Roosevelt Levins with Art Harris "Oriental Nights Boogie" on the More Rare Rock White Label LP. Listen here: Oriental Nights Boogie. 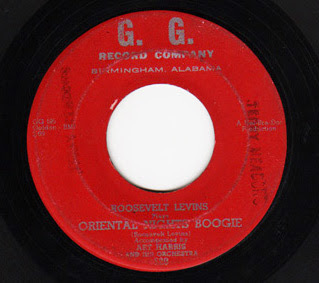 Oriental Nights Boogie is a rockin' instrumental that features boogie piano with some mambo and a little snake charmer thrown in. I have turned up little information on Roosevelt Levins, but a record of birth and death dates of December 27, 1935 - November 29, 2001 seems to fit. Like The Thunderbirds, he recorded with Art Harris and his orchestra. 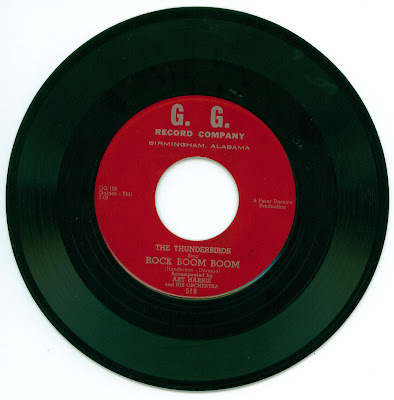 Paul Ozburn of the Birmingham Record Collectors remembers The Thunderbirds' "Rock Boom Boom", getting airplay on Birmingham radio in the 1950's. It's charming for many reasons but the horn parts really grab me. The song is included on the CD Harmony Classics, Volume 4: 28 Killer Doo-Wop Rockers and is the flip side of "Love is a Problem" (see below). Special thanks to Paul for the picture and sound clip! If anyone has more information about G.G. or Roosevelt Levins, please contact me!